I’ve never really talked about mental health on here, but I thought it might be time to talk about it. 1 in 4 people in the UK suffer from mental health problems each year, and as the title suggests I am one of those. My journey starts back in 2014 when the stress of losing my grandma and changes at work triggered anxiety and depression. I’d been struggling with sleeplessness where I would wake up with my heart racing, I would have what I now know as panic attacks and things would go round and round in my head to the point of obsession. I was quick to snap all the time and I ended up having some kind of breakdown on a family holiday. 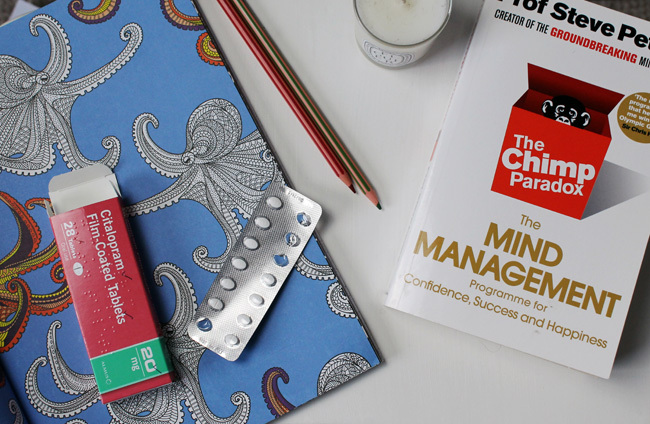 After six months of struggling I sought help from the doctor who diagnosed me with Generalised Anxiety Disorder, put me on an antidepressant called citalopram and I had a course of CBT. My anxiety improved, I learned techniques to help me cope with the irrational thoughts I was having and in 2015 I made the decision to come off the tablets and cope on my own. I tapered off slowly but it brought some pretty grim withdrawal symptoms like shooting pains in the head. Ultimately I decided I would never go back on them as I didn’t enjoy the side effects. Then back in September 2017 I went to the doctor and agreed to go back on antidepressants. So why have I gone back on them if I swore I’d never touch them again? Last year was pretty difficult with my mum being seriously ill in hospital and being unhappy in my job and the stress had meant my mood was up and down but I noticed I became very tired all the time and I didn’t want to do much except sleep. I thought at first perhaps I was just catching up from the last few months and I went to the doctors for a blood test which revealed I had a vitamin deficiency but even after I started taking some vitamins it got to the point where everything became too much trouble. I could barely get out of bed, the thought of doing anything – even baking a cake – became overwhelming, it was too much effort and I just thought what’s the point. I let things slide- my blog, the garden, my house. I just didn’t feel like me, I felt empty, like I was a shell of a person I once was and I was unsure if I’d ever be the person I used to be. I’d tried to combat it myself for a while. I’d tried being healthy, I’d tried exercising and reading a self help book, which don’t get me wrong did help but they weren’t enough. I wanted something else to take the strain, I wanted to feel like I wanted to do things again and I could get back on my feet again. I’ve been back on citalopram for 5 months now and I actually had different side effects this time around. I had excessive yawning and I had a bit of insomnia, but aside from that it’s been pretty smooth sailing. I definitely don’t regret going back on medication and I don’t feel like it’s the easy way out or that I’m a failure because I couldn’t cope with my problems on my own. The thing I would say is don’t be afraid of medication. Some people give it a bad rep but you take medication for diabetes, blood pressure etc, what’s the difference? I’d always recommend some kind of counselling because CBT helped me so so much and complimentary therapies are always beneficial but anti-depressants can help you find that balance and get back on your feet again so you can start managing it with other things. I feel so much better. I’m happier, I’m going to the gym regularly and I’ve lost 10lbs. I’m loving life and I feel like the old me has returned.